VX (S-[2-(diisopropylamino)ethyl]-O-ethyl methylphosphonothioate) is an odorless, colorless, human-made chemical that is the most toxic, rapidly acting of all compounds classified as nerve agents. Not found naturally in the environment, VX's only application is in chemical warfare. It is classified as a weapon of mass destruction by the United Nations in UN Resolution 687 and the production and stockpiling of VX was outlawed by the Chemical Weapons Convention of 1993. Developed in 1952, VX is the most well-known of the V-series of nerve agents and is considered an area denial weapon due to its physical properties. It is very slow to evaporate, being the least volatile of the nerve agents, and thus can persist in the environment and be a long-term threat in addition to a short-term agent. The development of VX reflects the important role of ethics relative to scientific discovery. With new technologies, human beings have an amazing capacity to make a world that is healthier and more pleasing. However, they also have the capacity to create weapons of mass destruction that have the potential for terrifying consequences. The intersect of ethics with science allows greater potential for reflection on the advancement of science in a way that is beneficial to humanity. Such reflection and international cooperation has lead to widespread destruction of VX stockpiles worldwide. A nerve agent is any of a group of phosphorus-containing organic chemicals (organophosphates) that disrupt the mechanism by which nerves transfer messages. The disruption is caused by blocking acetylcholinesterase, an enzyme that normally relaxes the activity of acetylcholine, a neurotransmitter. Nerve agents also are referred to as "nerve gases," although these chemicals are liquid at room temperature. VX has the chemical formula of C11H26NO2PS or CH3CH20-P(O)(CH3)-SCH2CH2N(C3H7)2. It is odorless and tasteless, and normally is in a liquid state. With its high viscosity and low volatility, VX has the texture and feel of motor oil. It also evaporates about as slowly as motor oil, and indeed is the slowest to evaporate of all nerve agents (CDC 2003). This makes it especially dangerous, as it has a high persistence in the environment. Indeed, the V in VX relates to its long persistence (Harrison 2007). It can last for days on objects under average weather conditions and for months under very cold conditions (CDC 2003). VX can be distributed as a liquid or, through evaporation or vaporization, such as through high temperatures, it can be distributed as gas. Exposure can be by skin contact, eye contact, inhalation, or ingestion. Although VX does not mix easily with water, it can be used to contaminate drinking water. It is particularly quick acting in vapor form, where symptoms can begin after a few seconds, while exposure to liquid form can be within a few minutes to 18 hours (CDC 2003). Compared to sarin (GB), VX is considered much more toxic if entry is through the skin and somewhat more toxic if inhaled (CDC 2003). Sarin and Tabun (GA) also dissipate quickly and have only short-term effects (Harrison 2007). VX is produced via the "Transester Process." This entails a series of steps whereby phosphorus trichloride is methylated to produce methyl phosphonous dichloride. The resulting material is reacted with ethanol to form a diester. This is then transesterified with 'N,N'-diisopropylaminoethanol to produce the mixed phosphonite. Finally, this immediate precursor is reacted with sulfur to form VX. VX can also be delivered in binary chemical weapons that mix in-flight to form the agent prior to release. Binary VX is referred to as VX2 (Ellison 2007), and is created by mixing aO-(2-diisopropylaminoethyl) O'-ethyl methylphosphonite (Agent QL) with elemental sulfur (Agent NE) as is done in the Bigeye aerial chemical bomb. It may also be produced by mixing with sulfur compounds, as with the liquid dimethyl polysulfide mixture (Agent NM) in the canceled XM-768 8-inch binary projectile program. Like other organophosphorus nerve agents, VX may be destroyed by reaction with strong nucleophiles such as pralidoxime. The reaction of VX with concentrated aqueous sodium hydroxide results in competing cleavage of the P-O and P-S esters, with P-S cleavage dominating. This is somewhat problematic, since the product of P-O bond cleavage (named EA 2192) remains toxic. In contrast, reaction with the anion of hydrogen peroxide (hydroperoxidolysis) leads to exclusive cleavage of the P-S bond (Yang 1999). VX is the most toxic nerve agent ever synthesized for which activity has been independently confirmed (CFR 2006). The median lethal dose (LD50) for humans is estimated to be about 10 milligrams through skin contact and the LCt50 for inhalation is estimated to be 30-50 mg•min/m³ (FAS). Federation of American Scientists (FAS). In liquid form, absorbed through the skin or eyes, it is much slower acting, perhaps even an hour or two or longer to take effect, but when aerosolized to yield the gaseous phase, it acts almost immediately on the victim (Harrison 2007). Since it breaks down in the body only slowly, repeated exposures to VX can have a cumulative effect (CDC 2003). As with other nerve agents, VX works by blocking the function of acetylcholinesterase. Normally, an electric nerve pulse would cause the release of acetylcholine over a synapse that would stimulate muscle contraction. The acetylcholine is then broken down to non-reactive substances (acetic acid and choline) by the acetylcholinesterase enzyme. If more muscle tension is needed the nerve must release more acetylcholine. By blocking the action of acetylcholinesterase, VX causes sustained contractions of all the muscles in the body. Sustained contraction of the diaphragm muscle causes death by asphyxiation. Early symptoms of percutaneous exposure (skin contact) may be local muscular twitching or sweating at the area of exposure followed by nausea or vomiting. Some of the early symptoms of a VX vapor exposure to nerve agent may be rhinorrhea (runny nose) and/or tightness in the chest with shortness of breath (bronchial constriction). Miosis (pinpointing of the pupils) may be an early sign of agent exposure but is not usually used as the only indicator of exposure (USArmy 2008). An individual who has received a known nerve-agent exposure or who exhibits definite signs or symptoms of nerve-agent exposure should immediately have the nerve agent antidote drugs atropine, pralidoxime (2-PAM), and diazepam injected. In several nations the nerve agent antidotes are issued for military personnel in the form of an autoinjector such as the United States military Mark I NAAK (USArmy 2008). Dr. Ranajit Ghosh, a chemist at the Plant Protection Laboratories of Imperial Chemical Industries (ICI) was investigating a class of organophosphate compounds (organophosphate esters of substituted aminoethanethiols). Like the earlier investigator of organophosphates, Dr. Schrader, Dr. Ghosh found that they were quite effective pesticides. 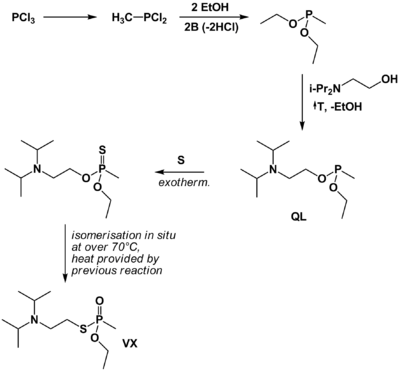 The chemists Ranajit Ghosh and J. F. Newman discovered the V-series nerve agents at ICI in 1952, patenting diethyl S- 2- diethylaminoethyl phosphono- thioate (VG) in November, 1952. In 1954, ICI put one of the V-series nerve agents, VG, on the market under the trade name Amiton. It was subsequently withdrawn, as it was too toxic for safe use. The toxicity did not go unnoticed, and samples of it had been sent to the British Armed Forces research facility at Porton Down Chemical Weapons Research Centre in Wiltshire, England for evaluation. After the evaluation was complete, several members of this class of compounds would become a new group of nerve agents, the V agents. Further commercial research on similar compounds ceased in 1955, when its lethality to humans was discovered. Among the V agents, the best known is probably VX, assigned the UK Rainbow Code Purple Possum, with the Russian V-Agent coming a close second. (Amiton is largely forgotten as VG.) This class of compounds is also sometimes known as Tammelin's esters, after Lars-Erik Tammelin of the Swedish Institute of Defense Research. Dr. Tammelin was also conducting research on this class of compounds in 1952, but for obvious reasons he did not publicize his work widely. VX was traded to the United States for information on thermonuclear weapons as the British passed over VX in favor of continuing with sarin as the UK chemical weapon of choice; the reasoning behind the decision is unclear, although the recent completion of a sarin production facility at Nancekuke may have played a part. The United States then went into production of large amounts of VX in 1961 at Newport Chemical Depot. Iraq under Saddam Hussein admitted to UNSCOM that it had researched VX, but stated that it had not weaponized the agent due to production failure. After U.S. and allied forces had invaded Iraq, no proof of weaponized VX was found, as reported in the Iraq Survey Group Final Report, which covered the period from 1980 to 2003 (ISG 2004). Subsequent investigation after the 2003 Invasion of Iraq indicated that Iraq had indeed weaponized VX in 1988, and had dropped three VX-filled bombs on Iran during he Iran-Iraq War (ISG 2004b; CFR 2006). It also is believed, but not proven, that Saddam Hussein used VX in a 1988 chemical attack on the Iraqi Kurd town of Halabja, a massacre that killed 5,000 people and serious health problems for many more thousands (Harrison 2007; CFR 2006). In December 1994 and January 1995, Masami Tsuchiya of AUM Shinrikyo synthesized 100 to 200 grams of VX which was used to attack three persons. Two persons were injured and one 28-year-old man died, who is believed to be the only victim of VX ever conclusively documented in the world (Zurer 1998).The VX victim, whom Shoko Asahara had suspected as a spy, was attacked at 7:00 a.m. on December 12, 1994, on the street in Osaka by Tomomitsu Niimi and another AUM member, who sprinkled the nerve agent on his neck. He chased them for about 100 yards before collapsing, dying 10 days later without ever coming out of a deep coma. Doctors in the hospital suspected at the time he had been poisoned with an organophosphate pesticide. But the cause of death was pinned down only after cult members arrested for the subway attack confessed to the killing. Ethyl methylphosphonate, methylphosphonic acid, and diisopropyl-2-(methylthio)ethylamine were later found from the body of the victim. Unlike the cases for sarin (Matsumoto incident and Sarin gas attack on the Tokyo subway), VX was not used for mass murder. An accidental release of VX from the Dugway Proving Ground in Utah, where United States Army chemical and biological warfare programs were conducted, is believed to be the cause of the Dugway sheep incident (or Skull Valley sheep kill), which was a 1968 kill of thousands of sheep. The United States Army did admit to conducting open-air tests with the nerve agent VX in the days preceding the sheep kill. The only countries known to possess VX are the United States and Russia (CFR 2006). However, under Saddam Hussein's regime, Iraq was suspected of buying VX (CFR 2006). In 1998, a Sudanese pharmaceutical facility was bombed by the U.S. (Clinton Administration) following allegations that it in some way used VX and that the origin of the agent was associated with both Iraq and Al Qaeda (Chomsky 2001). However, the chemical in question was later identified as O-ethyl hydrogen methylphosphonothioate (EMPTA), used to treat seeds and turf grasses (Coleman 2005). In the late 1960s, the U.S. canceled its chemical weapons programs and began the destruction of its stockpiles of agents by a variety of methods. For example, the Newport Chemical Depot completed their VX stockpile destruction in August, 2008 (CMA 2008). Worldwide, VX disposal continues, since 1997 under the mandate of the Chemical Weapons Convention. The United States is providing support for Russian destruction activities. Centers for Disease Control and Prevention (CDC). 2003. Facts about VX. CDC. Retrieved January 27, 2009. Chemical Material Agency (CMA), U.S. Army. 2008. Depot confirms VX stockpile eliminated. CMA News Release August 11, 2008. Retrieved January 27, 2009. Chomsky, N. 2001. 9-11. An Open Media book. New York: Seven Stories Press. ISBN 1583224890. Council on Foreign Relations (CFR). 2006. VX. Council on Foreign Relations. Retrieved January 27, 2009. Ellison, D. H. 2007. Handbook of Chemical and Biological Agents. New York: CRC Press. ISBN 0849314348. Federation of American Scientists (FAS). n.d. Types of chemical weapons. Federation of American Scientists. Retrieved January 27, 2009. Harrison, K. 1998. VX gas. Molecule of the Month for June 1998. Retrieved January 27, 2009. Iraq Survey Group. 2004a. Final Report, volume 1. Iraq Survey Group Final Report. Retrieved January 27, 2009. Iraq Survey Group. 2004b. Final Report, volume 3. Iraq Survey Group Final Report. Retrieved January 27, 2009. Kim, C. 2005. History of Chemical Warfare. New York: Palmgrave MacMillan. ISBN 1403934592. United States Department of the Army (USArmy). 2008. US Army toxic chemical agent safety standards. DA PAM 385-61. Section 7-8 Self/Buddy Aid Procedures. Retrieved January 27, 2009. Yang, Y.-C. 1999. Chemical detoxification of nerve agent VX. Acc. Chem. Res. 32(2): 109-115. Retrieved January 27, 2009. Zurer, P. 1998. Japanese cult used VX to slay member. Chemical and Engineering News 76: 35. History of "VX (nerve agent)"
This page was last modified on 13 January 2016, at 16:50.